Over the last year, since Metro Area Transit (ol’ Uncle MAT) rebranded their service as Metro, the system has been updating the look and feel of their public information. An initiative that began with a fresh design for the Metro website is now being seen in a redesign for the paper schedules. 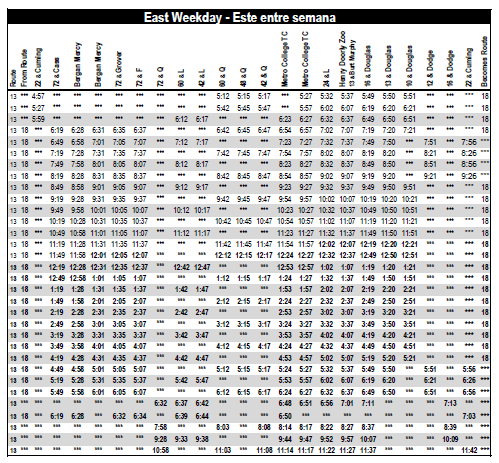 As Metro rolls out route updates, they area also showing off their new schedule designs. The updated maps and time tables are a vast improvement over the previous versions and point toward a serious commitment to quality information design. While all the time tables are revised, not all of the maps have been updated to the new, clearer design. This gives us an opportunity to point out the previous style and contrast it with the new, improved design paradigm. We will look at examples of each and point out how the changes represent real improvement. When designing a visual display of data, whether a map, a chart or a graph, every mark has meaning. When you include extraneous or purely aesthetic marks, you end up with what information designer Edward Tufte calls chartjunk, information that not only doesn’t add information, but obscures the information the chart intends to communicate. Consider the old-style of the 15/55 map, shown above. The gray field cut into plots by the road grid of Omaha serves as a geography lesson. Or it would, but the map is incomplete and only shows the streets with which the route interacts. The choice to limit information isn’t wrong, but the implementation causes confusion. 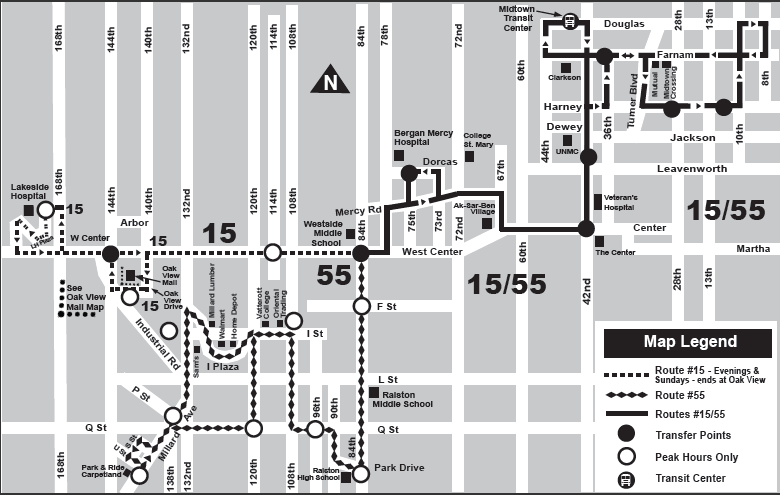 The huge, printed numbers — 15/55, then, where the routes split we see a 15 and 55 — are unclear in purpose, and unnecessarily repeat information provided in the map legend. Looking at the street grid, this map leads the viewer to assume that no east/west roads north of Center Street and west of 72nd. Where the map implies a representation of the city, it comes up short — as well is should; a transit map should only be a map of the transit system and the purpose of the map is to guide the user from place to place. Next, notice the nodes on the map indicating a transfer point. While this information is crucial, it is incomplete. The old maps spent so much “ink” on portraying the street grid, they crowded out a rich portrayal of the transit system. 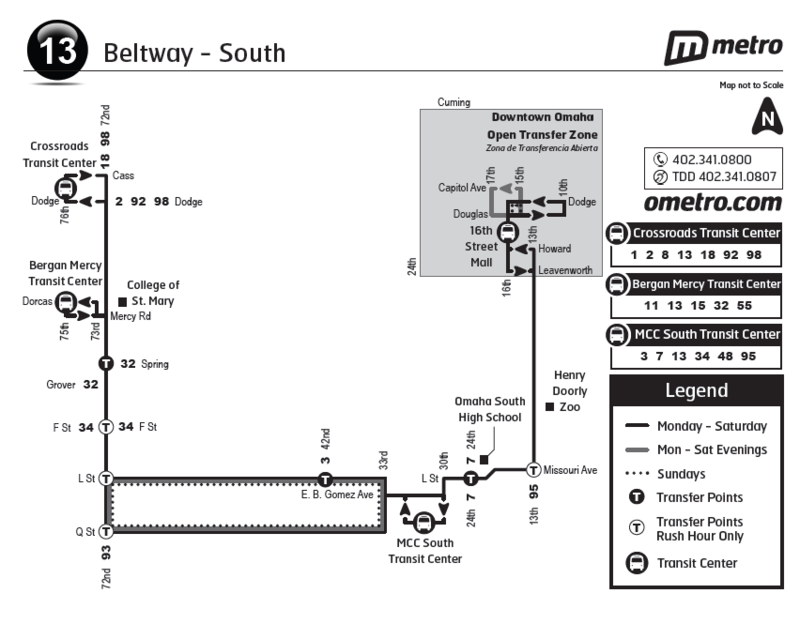 On the old map, interpreting the transfer nodes required correlating with a separate graphic on a different part of the schedule that indicated the routes available at each transfer point. New style of the route 13 map. On the updated maps, the designer has stripped away all but the necessary information. Instead of a map of Omaha, we only see a map of the route. The lines are modest and clear, the eye is given only relevant information and there are no deceptive omissions. The best addition is the inclusion of transfer routes on the map itself. See, on the maps above and below, at each transfer point, the place, direction of the street, and route number are indicated with text. 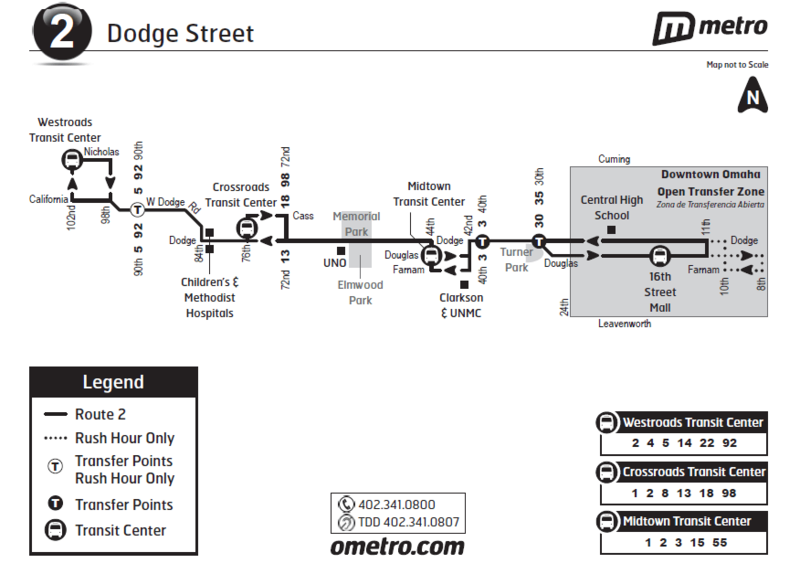 When dealing with a transit center, where listing the transfer routes on the map could cause confusion, the designer uses an inset guide, on the same graphic, to show all the routes available at each center. The time table update is minor, but important. The tables retain the orientation of location progressing from left to right and time progressing from top to bottom (this is the opposite of the website, and this writer thinks the two should be the same, and should both follow the paper model). The main update to the design is the addition of alternating shaded and unshaded rows. This change allows the reader to follow the progress of a particular bus with greater ease. This update is most helpful if one is attempting to gauge the arrival of a bus to a stop between two indicated points. Overall, the new maps and time tables show great promise and seem to indicate a serious commitment to clear, effective information design. Each improvement, each step in the right direction, indicates that Metro is dedicated to making the bus more acceptable and more accessible. The new maps and tables make the system easier to understand and navigate. As riding the bus becomes easier, people lose their excuses, one by one, and we will see transit usage begin to grow. As the trend toward clarity and transparency continues, Metro can build on this success to make the transit system more welcoming and accommodating for everyone. I think they need to do more development and get feed back from new riders or those new to a route. The old one’s have too much information but the new one’s don’t have enough for an occassional ride like myself. Great point. You might consider letting Metro know what you think on their comment form as well: http://ometro.com/contact/comment-form. Looks like a lot of thought was put into these maps. Like the one-line diagram idea. It would be nice, however to add some context. Showing major intersecting streets graphically might help the reader with reference. Good idea. You might consider also letting Metro know what you think on their comment form: http://ometro.com/contact/comment-form. What I really need is a map showing where every single stop is. When I first started using the bus, I thought that I had to walk 2 blocks to catch my number. Turns out I am able to use the stop right on my block, but no map and no transit schedule showed me so. There are many places that a bus can pick you up and drop you off that can be much more convenient but without a map showing where every single bus stop sign is, it’s like an Easter egg hunt and incredibly frustrating at times. That does sound like a good idea. You might consider letting Metro know what you think on their comment form as well: http://ometro.com/contact/comment-form.